The form of worship aims to give reverence to God, whilst at the same time giving expression to profound Christian joy. The preaching is centred around Christ, and in particular His saving death on the cross, where the thrust of the message is forgiveness of sins through faith in Jesus Christ. The church Confession of Faith is based on the 1823 Confession of Faith of the Calvinistic Methodists. An additional clause has been added to allow for believers baptism. We set much store in waiting upon the Lord for a gracious Divine Visitation, and at the same time working with zeal for the Gospel. We see this balance in the lives of Rowlands, Harris, Williams, Whitefield and Wesley (the Christian leaders of the 1700′s), who experienced great things of God, and at the same, time toiled strenuously for the Gospel. May the Lord give us something of their blessing and their zeal for Christ. Tabernacle Cardiff uses the Authorised Version of the Bible, and sings primarily from ‘Christian Worship’. A hymn book of Vernon Higham’s hymns is also used at the services. The church had previously used ‘Christian Hymns’ before purchasing copies of ‘Christian Worship’. Tabernacle Cardiff is an independent church formed in 2003. Services were established in a rented hall (Heath Citizens Hall) during September 2003. The church worshipped at the hall from 2003 to 2009. Through the Lord’s grace and providence the church acquired property in January 2009. The church now worships at Pen-y-wain Road. Dewi Higham was invited to be pastor of the church in September 2003. Vernon Higham was the pastor emeritus from the formation of the church in 2003 until passing into the glory in 2016. Pastor Dewi Higham – 1993 – 1998: Dewi Higham was pastor of a Welsh language church at Tregaron, West Wales – Eglwys Efengylaidd Caron. He also ministered during this period at Rhos Llangeler. 1998 – 2003: Five Years as an assistant pastor at Heath Church (Cardiff). 2003 – 2017: Pastor at Tabernacle Cardiff. Pastor Vernon Higham – 1955 – 1958: Vernon Higham’s first pastorate was at a Welsh language church at Pontardulais, near Swansea and Bethlehem, Penyrheol. 1958 – 1962: He ministered for four years in another Welsh language church at Llanddewi-brefi, West Wales. 1962 – 2002: He was called to Heath Church (Cardiff) in 1962, where he ministered for forty years. 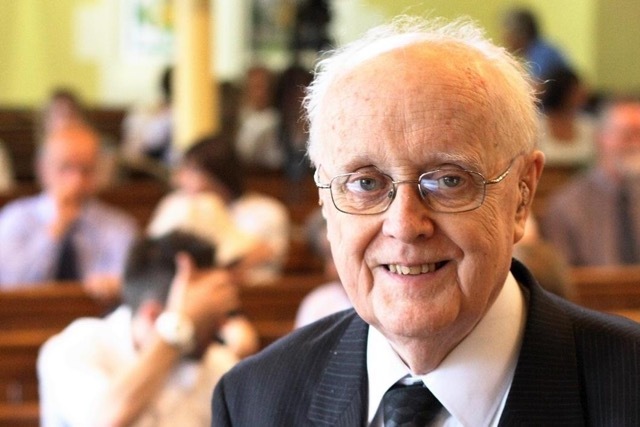 2003 – 2016: Pastor Emeritus at Tabernacle Cardiff.